I have wanted a dog to join our family for years. Many years. 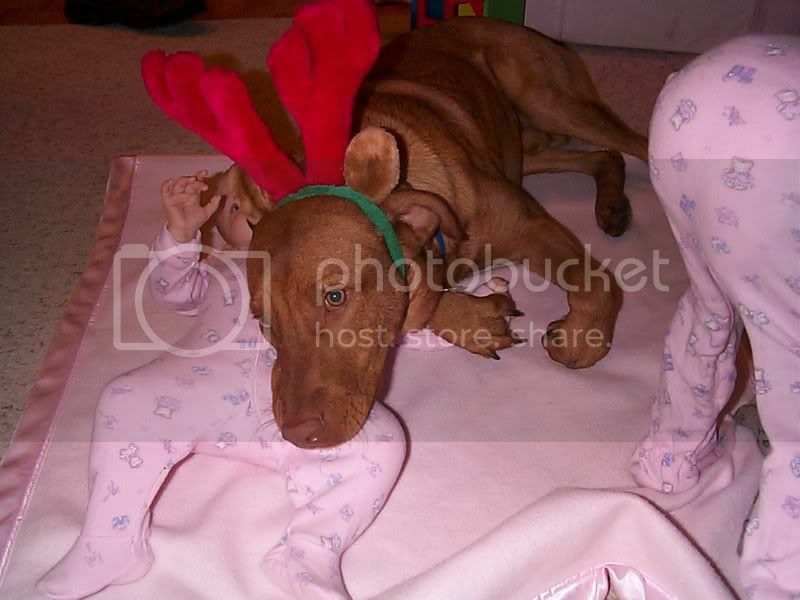 We did adopt a beautiful Vizsla from our local animal shelter in 2005. We named him Chance and he was lovely. At this time I was a stay-at-home-mom with a newborn, and an 18 month old. We adopted him around Halloween time, but by Christmas many of his bad habits had begun to emerge. Chance was a CHEWER. A major chewer. He destroyed our patio furniture, the installation around the feed and return of our AC unit, and try as I may I could not retrain him. And then I discovered I was pregnant again. Uh oh! 3 babies under 3 and a chewer dog? Nope. Not happening. I was able to re-home him and we've been dog free since then. Chance with Ella (he loved her!! and Haley (standing) Christmas 2005. Fast forward to December 2012. Our kids are now 6, 7, and 8. I am again a stay-at-home-mom, and I'm also a runner. I can think of no better running partner (besides my kids) than a dog. I am having visions of running in the morning with my dog. I am having visions of my kids squealing with delight as they play chase, fetch, dress-up and other games that kids like to play with dogs. Don't get me wrong, I know dogs are work. I grew up always having a dog. Big dogs; Irish Setters, Golden Retrievers, Labs. I know that they poop and that I'll have to clean that poop up from the backyard so that kids and husband don't step in it. I know dogs need medical care to keep them healthy. I know all about what it means to be a dog owner. And I still want a dog. For our family, I think a Labradoodle is the best choice. Haley and I both have pet allergies and while all of these 5 species are considered hypoallergenic species, the labradoodle is very intelligent, easily trainable, they don't get too big and they love kids!! That's what I want for Christmas. A dog. I know we are ready to add a new addition to our family. Will I get my wish on Christmas morning? Probably not. I might have to wait for all those parents who went out and bought their kids a Labradoodle puppy for Christmas only to realize that they weren't ready for a dog, and then I'll swoop in and take it off their hands. Do you have a dog? What breed? Do you run with your dog? What kinds of fun things do you do with your dog? Tap in to the LIGHT side of the Force. This side is aligned with honesty, compassion, mercy, self-sacrifice, and other positive emotions. We should all strive to spend as much time here as we can. The Dark side is where too many people live. This side is full of anger, fear, aggression. It can quickly consume you. It will forever dominate your destiny, consume you. The dark side is quicker, easier, more seductive. 1. Admit you’re not perfect, but be positive. I’ll be the first to say it: I’m far from perfect. I’m a jerk sometimes. I’m inconsiderate and selfish sometimes. And I don’t usually realize it until later. If you think you’re not a jerk, at least admit that you are inconsiderate at times. Try to recall those times. Think of how you could have acted differently. This is the first step, and it’s an important one. 2. Place yourself in the shoes of others, but be humble This is the key to consideration — to consider the feelings and needs and wants of others, to see things from their perspective. Try to think of what others are going through, what you’d want if you were in their situation. This isn’t always easy, but it gets easier with practice. And even if you’re not correct in your assumptions about what another person wants or feels or is going through … the important thing is that you’re making the effort. 3. Act with compassion and kindness. If someone else is suffering, even a little, try to ease their suffering in some way. Treat others with kindness, respect, love. Do it in little ways — a smile, a kind word, a thank you, a hug, doing something to ease their burden, going out of your way to be courteous, holding open a door, letting another person in front of you in traffic. Little tiny acts will make a huge difference. 4. Practice, practice, practice. Old habits die hard, especially ones like this where we rarely think about it. Keep it in the forefront of your consciousness by making every interaction with another person a chance to practice being considerate. Every time you talk to someone, email someone, tweet someone, or see someone on the street … make this an opportunity to practice consideration. Practice, and practice some more. That’s the only way you get good at anything. 5. Do 5 little things. As a way to practice, make it a goal to do 5 little things each day that are kind and considerate. It doesn’t matter what those things are — cooking something for a family member, pick up your husband's socks, sending a nice thank-you email to your aunts, lending a hand to a neighbor, or hold the door for someone. You can also be nice to the community and the world by volunteering. I’m sure you could think of a thousand little things. Do this every day, and you’ll soon be a pro. If the world ends tomorrow, what will you do today? Do I believe that the Mayan apocalypse is correct and the world is ending tomorrow? Nah. Do I believe that a lot of people believe it is going to happen? Yup. Tomorrow my family and I are bunking in. We're not going out ANYWHERE! No school, no gym, no Girl Scouts, no work for husband, N.O.T.H.I.N.G. Extreme? Ya, probably. Cautious, you bet. We in no way believe that a giant rock is going to come hurtling out of space and destroy our planet. Nope. But we wouldn't put it past a group of radicals to attempt a wide-scale attack on our country causing mass panic. And we'd rather be together, safe at home IF that happens. Which it probably won't. After all the craziness that we've seen not only this week, but this past year, and heck the past decade, we've decided that we're going to play it safe and stay home as a family and bond. We're going to make Christmas cookies (something we have not done in 4 years!!) make Rice Krispy treat holiday houses, play games, the kids have planned a talent show. Today I am spending all day with the kids at their school. My 6 and 7 year old are participating in a Holiday musical, my 8 year old is doing some crafty thing in her class (oh help me, I am not crafty), 6yo is making gingerbread houses, and I will be having lunch with each of them. This will be the FIRST time this year I've been able to have lunch with my guys and the FIRST time this year that I've been able to make it to a daytime event at school. So if the world ends tomorrow, I will have spent today with the three most important people in my life. Showing them how important they are to me, and how much I love them. And sometime today (and tomorrow) I need to fit in a workout. What are your thoughts on the Mayan apocalypse? Are you doing anything different tomorrow because of it? ?